Beachy bridal hair is all about a loose, romantic look. 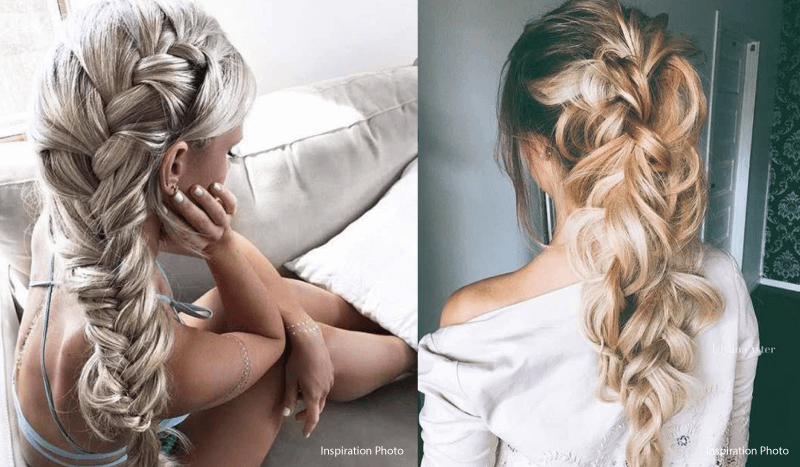 Although waves, loose curls and soft up-dos are all great beachy bridal hairstyles, we recently found some braided Boho inspiration we just had to share! Whether you wear your boho bridal braid to the side or straight down the back, this look is perfect for a beach wedding! Add a few fresh flowers or a beaded hair accessory and this look can easily go from casual to beach glam! Our bridal hairstylists have more experience than any other salon in Los Cabos when it comes to styling brides for their wedding day. If you love these beachy boho braided looks, then don’t hesitate to contact us for a complimentary consultation about your wedding-day hairstyle. This entry was posted in Blog, Cabo Bridal Hair and Makeup and tagged Amazing ideas hair, Be the Bride, beach wedding, beachy bridal hair, Bohemian look, braided, braided boho inspiration, Bridal Hair, bridal hairstylist in Cabo, Hair Stylist in cabo, inspiration photos, romantic look, Sea style, wedding braided hair, wedding hairstylist, wedding in the beach.